Vivian & Don | Love It or List It Galleries | Merit Kitchens Ltd.
Who doesn’t love a character home? But they do have their challenges, especially when it comes to a major renovation or home improvement project. Vivian & Don’s home was full of bulk heads that are difficult, if not impossible to move –common in older homes. Since Jillian and her team were unable to move them, they were incorporated into the redesign by adding crown molding to give them a heritage feel. 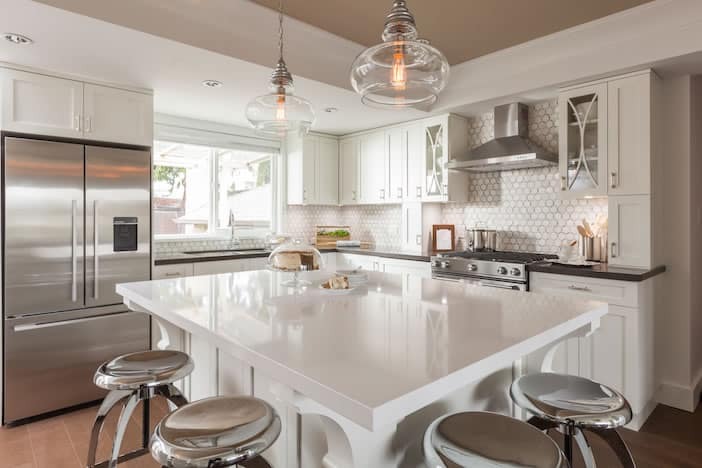 Jillian’s team knocked down a few walls and opened-up the kitchen, living and dining room into one large, open-concept space. It gave the illusion of added space, and created lots of new counter space. Old appliances were replaced with modern, stainless steel versions. And the team added a wine cellar within the home’s existing square footage. Additional Features: The furniture-like island features a comfortable eating area for four as well as a generous prep-area/work space. Arc mullions adorn the elegant glass doors.